Prominent & Leading Manufacturer from Coimbatore, we offer clay brick making machine and automatic clay brick making machine. Single Set Pug Mill have single grinding and Double set Pug Mill to have double grinding, mixing and pugging of Clay. The Roll Size is 18" x 20". 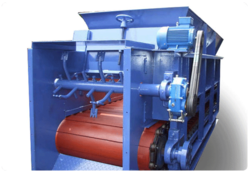 The rolls are fitted with safety clutches and adjustment for coarse grinding. The whole body of the machine is heavy duty cast iron parts which are properly machined for accurate fittings. Cutting Table: M.S. Fabricated manual clay bricks cutting table having the option of Side Stamping/Upper stamping system. 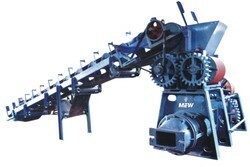 Capacity: 6 to 12 bricks per cutting or as per the size of bricks. Trolley: G.I. Fabricated Single/Double Wheel Trolley with Wooden Platform.Capacity: 50 to 80 bricks. Counter Fittings & Accessories: Includes 3:M.s. Counter shaft, Loose Pulley, Tight Pulley, Heavy duty bearings, Bearing Block, Foundation Bolts & Nuts, Rails, V Belt, Flat Belt, Wooden Die. Production Capacity: 2500 to 3000 bricks per hour. The Production Capacity will vary according to the size of bricks. The weight of Machine: 3950 Kgs(approx.) complete machine with assembly. The Box Feeder receives raw material and delivers it at a constant/controlled rate to the next stage of manufacture. The box feeder is fitted with a moving steel slat plate bottom of which the speed is adjustable. A sliding shuttle door controls the amount of material leaving the feeder. Normally, a large hopper is attached to the main body during the erection/installation. It is used to break own lumps of hard and stiff clay and shale to manageable sized pieces. The disintegrator has 2 rollers with an adjustable gap, running at different speed. One roller is smooth faced and the other has renewable braker bars set in the face. It is used to grind the broken down clay to finer particles. This machine consist of 2 rollers attached with a small gap between them. The rollers revolve towards each other at different speeds, tearing and grinding the clay to the required size. The Double Shafted Mixer is normally positioned just before the extruder in the plant layout. The function of a double shafted mixer is to mix clay and water together and knead them into a homogenous mass ready to e formed into the desired shape. The function of the extrusion machine is to accept the prepared clay and form it to the required shape. Normally, the clay is fed to the top section of the extruder where the final mixing of clay is done. The clay is then compressed and shredded before falling through the vacuum chamber where air is removed, thus making the clay much harder, tougher, improving the end product. After deairing, the clay is compressed into a strong mass and extruded as a continous column. It is designed to meet the extruding solid or hollow column and the wire cut is fast, reliable and standardised. The main advantage of this cutter is that there is absolute uniformit of brick size with a straight cut and without waste ends. Looking for Clay Brick Making Machine ?